SDS and SJP host discussion on the ‘Black Radical Tradition and Palestine’ | Fight Back! 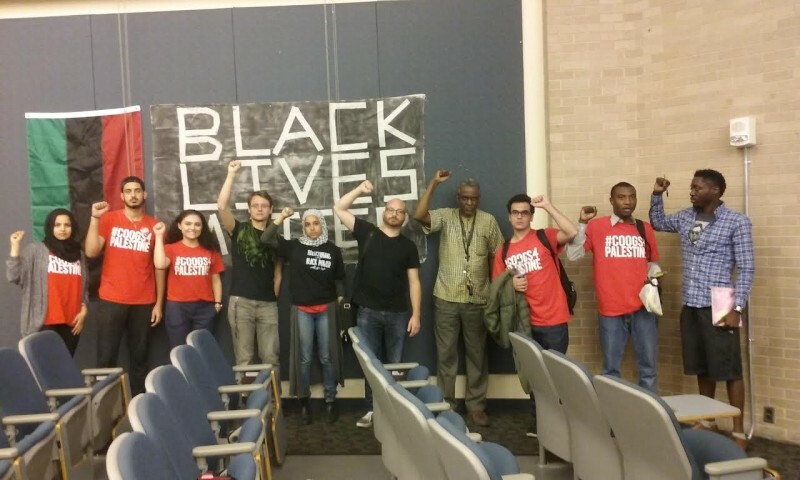 Houston, Texas - On March 27, Students for a Democratic Society (SDS) and Students for Justice in Palestine (SJP) hosted a discussion at the University of Houston called “The Black Radical Tradition and Palestine” with Dr. Gerald Horne, chair of African-American Studies at the University of Houston (UH). Over 50 students and people from the community who showed up to learn about the history of Black activism and about the importance of solidarity between Black people and Palestinians in America. Dr. Horne started off the lecture by stating that the main point of his speech was reciprocity. He went on to speak about the ongoing subjugation of the Palestinian people by Israel and the U.S., which still exists to this day. Dr. Horne drew attention to the similarity of the oppression of African Americans and Palestinians, and the overlap between their struggles. He highlighted how in the same way that people like Alton Sterling and Eric Garner are murdered by the police because they are Black, Palestinians are murdered by the U.S.-backed Israeli forces because they are Palestinian. He pointed out how both face powerful U.S. imperialist forces in their struggle, and that both of their struggles demand self-determination. Horne explained that for solidarity to exist between the Black and Palestinian community must enter a metaphorical marriage. Horne stated, “Black people have always worked in solidarity with other nationalities, to fight against racism, colonization and oppression.” He indicated the impossibility of fighting against imperialism alone, and that all oppressed people need to unite in a common struggle for national liberation. He gave examples of Black leaders such as Paul Robeson, who stood in solidarity with Moscow, and Black nationalists who were in solidarity with oppressed peoples movements internationally. “I think going forward in the 21st century, reciprocity should be our bible,” Horne said. After the event, there were interesting discussions between activists from the two movements on how to fight together in a common struggle. A Palestinian student at U of H spoke about what she learned about the oppression of Black people and how white racism and colonialism oppresses all people of color. After the lecture, a group of Zionist students who had tried to disrupt the event during the question and answer session were trying to speak to students outside the auditorium. When this was discovered, all the students left the lecture hall and shouted them down with "Free, free Palestine! Occupation is a crime." The Zionists tried to have a confrontation, but their words were drowned in a sea of loud chanting. This continued for over ten minutes, until the students finally drove them out of the building and off campus. Riley commented, “I couldn't believe the Zionists in the discussion who were defending Israel. It reminded me of people who deny the existence of racism and then find all sorts of ways to justify it." The discussion was part of Israeli Apartheid Week, which consisted of a series of events to draw attention to the illegal military occupation of Palestine by the U.S.-backed state of Israel.